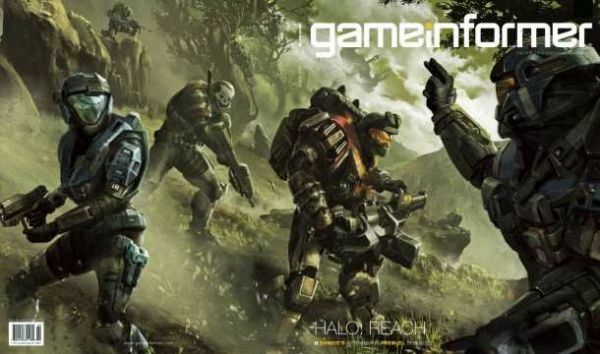 Issues of GameInformer are hitting subscribers hands, and with that the first details of Halo Reach have been unveiled. The article focuses on all the upgrades the engine is receiving, making the game the best looking and most fluid Halo game to date. For the first time all characters will be motion captured, providing smooth animation throughout the game. The engine, though it's unclear whether it's a new engine or an upgrade to the existing Halo 3, is a lot more robust supporting dynamic weather and 20 to 40 dynamic light sources. As a comparison, Halo 3 had 3 to 4 dynamic light sources. Despite upgrades in one area, the game is actually going back to Halo 1 roots, it is a prequel after all, and bringing back the shield and health system. We'll also see many Halo 1 weapons return, yes the magnum, as well new ones like the Designated Marksman Rifle and a Carbine Needler. There's also new moves like stealth kills, and armor abilities like Cloak and Sprint. The game features six characters, each with their own "class" and specialty. They are all part of "Noble Team" - consisting mostly of class III Spartans. Carter-259 – The leader of Noble Team. Jorge-052 – Heavy weapons specialist, and a Spartan II. The main character is Noble-6, the one you'll be playing in single player. But what about co-op? There's nothing specifically mentioned, other than it would have features in line with previous Halo titles. With what's laid out above us, we have to assume our previous assumptions were correct. 6 player co-op is in the works, Bungie just may not be ready to unveil, and/or, commit to it. Update: According to CVG they are claiming 4 player co-op again. Here's the snippets. For now take this all as somewhat rumor and hear-say. Until we get the magazines in our hands officially or GI updates their site at least.